Disk scanning utility with game engine interface. Is there a better alternative to Disk Falcon? Is Disk Falcon really the best app in File Management category? Will Disk Falcon work good on macOS 10.13.4? 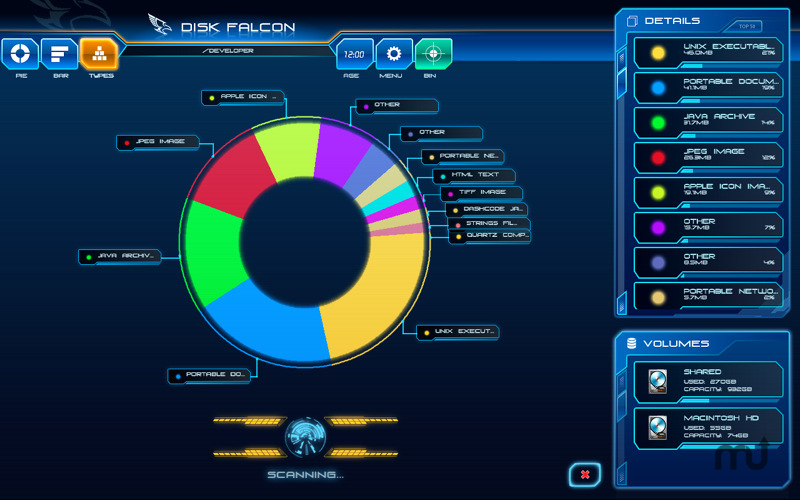 Disk Falcon…Did you ever wonder what would happen if a game studio wrote a disk scanner using its game engine? Wonder no more. Introducing Disk Falcon, a brand-new disk scanning utility for Mac OS X. Based on highly acclaimed game engine used in "Ultraviolet Dawn", Disk Falcon shines with the polish of over three years of engine development and testing. Disk Falcon needs a review. Be the first to review this app and get the discussion started! Disk Falcon needs a rating. Be the first to rate this app and get the discussion started! Disk Falcon will quickly analyze the contents of a drive or a folder, laying out exactly what is occupying the space on your hard drive (or even on networked drives). The results can be broken down by individual files, file types, or ages, and presented in either doughnut or bar chart (and, of course, these animate as well while the scan is ongoing). Unneeded files or folders can be dragged and dropped onto the special bin button to be queued up for deletion later. Disk Falcon even comes with a sci-fi inspired vocal responses to your actions within the program (which can be turned off if desired). Doughnut or bar chart visualization styles. Breakdown by individual files, file types, or file ages. Real-time, animated scanning feedback and updates. Ability to queued up and delete unneeded files from within the program. Support for dragging and dropping files and folders from Finder to perform scanning. Vocal responses to your actions within the program. Full-screen mode for enhanced visual experience. "Show in Finder" option for all files.